This section will introduce you to our goal and how we plan to accomplish it. My name is Eduardo Born and I'm 29 years old. I reside in the USA, but I'm natural of Porto Alegre, Brazil. 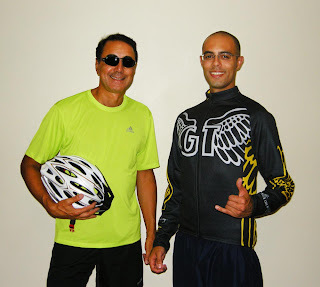 My partner in this adventure is my uncle, Gilberto Fonseca, 55 years old, also from Porto Alegre, Brazil. We are two riders who are planning to cross the USA on a bicycle, sleeping on campgrounds and desert places throughout the way. We will start from Charleston, South Carolina and go on a bicycle up to San Francisco, California. It will be a 3600+ miles ride. But this is not supposed to be just a physical challenge. Our goal is to, throughout our way and to those who follow us, promote a different kind of lifestyle. A healthy one. One where material things are just the means through which we reach our friends, have good times and unexpected experiences. At the very least 55 days, at most 70, depending on weather conditions, possible injuries and other unforeseen difficulties. In the following months we will be updating you with the details of our planning and progress as we go through it. Everything from our choices of equipment, route details, and a daily report of where we are and how we are doing.